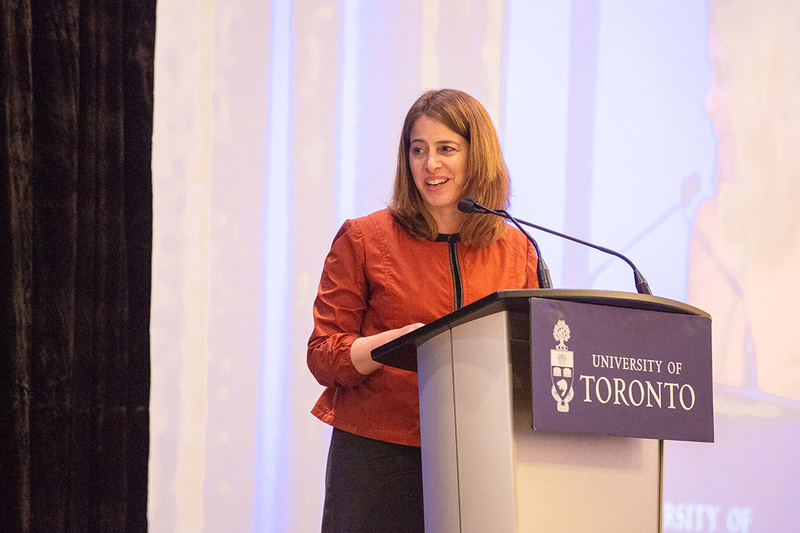 Before the first-ever conference by U of T's new School of Cities, co-hosted with the office of the vice-president, research and innovation, Brail brought one of the guest speakers – Kim Walesh, deputy city manager and economic development director of San Jose, Calif. – on a tour of Toronto. They visited Toronto's waterfront, Union Station and the Bentway, the 1.75-kilometre public trail under the Gardiner Expressway. “You have the idea that Toronto's star is rising, but you don't know how an outsider sees it,” Brail, U of T's presidential adviser on urban engagement and director of urban studies, told U of T News. It turns out that Walesh (pictured left) says she was inspired by Toronto, which she was visiting for the first time. She was impressed with Toronto's residential density and the restoration of the almost century-old train station, which has made the transit hub itself a worthwhile destination. It is, she says, a city like her own that is facing the challenges that come with growth, such as ensuring that everyone shares in the benefits of prosperity. “It's the conversations we have with each other about our city that ultimately make the difference in navigating change,” she told the audience at the conference, Toronto: Towards a Smart and Inclusive City-Region. Nothing important happens in a city today without collaboration between experts of different backgrounds and sectors, she added. That inter-disciplinary collaboration was on display Tuesday as Walesh joined policy makers, academics, and community and industry leaders, including executives from Uber and Sidewalk Labs (the Google sister company planning to redevelop Toronto's eastern waterfront), to discuss the future of cities like Toronto. San Jose, Welsh said, grew from a city of fewer than 100,000 people in 1950 into one with over a million residents – a population boom due in large part the success of Silicon Valley. “Now we want to be more urban, just like you,” she said. To do that, San Jose is building up instead of out, and trying to reduce residents' reliance on cars. And, like Toronto, San Jose is trying to deal with rising house prices and rents. “This very idea that our city is becoming more attractive to tech companies and workers is understandably causing fear and anxiety,” she said. Both cities are collaborating with tech giants to work toward equitable growth. One of the prime examples in Toronto is the Sidewalk Labs project in the Port Lands. Last year, the urban innovation company and Alphabet subsidiary won a bid to redevelop 800 acres on the eastern waterfront as a data-driven, efficient and sustainable neighbourhood. In conversation with University Professor Janice Stein, CEO of Sidewalk Labs Dan Doctoroff addressed the elephant in the room: privacy concerns. “Privacy itself, and data and how you use it, has to actually be built into every single thing we do from the very beginning to earn the trust of people,” he said. Sidewalk Labs hired Ann Cavoukian, a former Ontario information and privacy commissioner, as an adviser. Doctoroff said the data could be held in a trust led by government representatives and privacy experts. Sidewalk Labs not only intends to build a smart neighbourhood, but an inclusive one, Doctoroff added. After looking at other sites in Europe, North America and Australia, Sidewalk chose Toronto because of its commitment to inclusivity. Ironically, Doctoroff said, Toronto's values are attracting so many people that the city is becoming less affordable and more congested, pushing low-income people away from centres of opportunity. "We believe that thoughtfully applied technology" will help us close the chasm between the city's aspirations and reality, he said. These problems aren't unique to Toronto, as University Professor Richard Florida, director of the Martin Prosperity Institute at the Rotman School of Management, made clear in his remarks. Florida says the “the new urban crisis” – the title of his new book – “is about the evisceration of the middle class across the board.” People will turn to U of T's new School of Cities to design the tools and models to make cities more inclusive, he added. “I have no doubt we'll do it,” he said. U of T President Meric Gertler, an urban geographer known for his work on innovation and the economies of city-regions, told the conference that the university's new School of Cities is uniquely positioned to tackle urban issues such as climate change, inclusion and transportation. The complexity of urban challenges requires multidisciplinary approaches, he said, adding that more than 200 faculty members across 40 academic units at U of T are involved in urban research. The university's three campuses – downtown, Mississauga and Scarborough – also give its researchers an edge when it comes to examining and solving problems facing different parts of a city, he said.